If you have read this column for very long you know I feel that planning will make your financial life turn out exponentially better in the long run. Some would even say that I am being preachy, especially some of my clients. But planning thoroughly and correctly resolves a lot of issues and prevents lots of problems later on. There is no area where this is true more than end of life planning. No one likes to think about their own demise but we all know that death is waiting down the road. And the older you get the faster you seem to travel down that road. Yet many of us don't do much planning for it. We figure we aren't going to be here after words so why worry about it? This also goes for what happens if somewhere along the road you become unable to make decisions and unable to take care of yourself. The baby boom generation is right in the middle of dealing with these end of life issues, either for themselves and their spouse or for parents. Anyone who has been through this is already going to know that doing some planning now may avoid huge problems down the road. wish I had the space in this column to go through some of the horrible things that I have seen happen because people just wouldn't do a little planning so that their loved ones would be taken care of. It is not that hard but you have to be methodical and thorough. If you miss one seemingly little thing you can cause a major problem. Everyone's situation is different and the more complicated your finances are the more planning and attention to detail will be needed. I would recommend that you get someone competent to help you because unless you are an expert in a lot of areas you are going to miss something. You need to have a will or a trust. Everyone who has any assets or children needs to have this document. Don't use a do-it yourself or on-line will kit this is one way things get missed. They are better than nothing, but not by much. 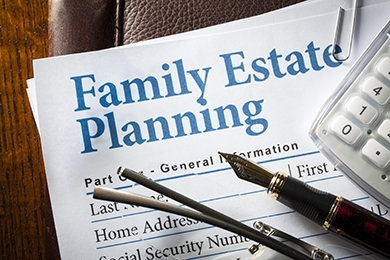 See an attorney that does estate planning not the one you used for your last legal problem. The attorney will also have you do some other things like health care and financial powers of attorney. If you were to die or become unable to make your own decisions without these documents it may create great hardship and expense for your loved ones at a time when they are not able to make good decisions. This is important because I have seen lots of families fractured and money lost because of poor estate planning or people just didn't listen to good advice. While it's true that it's your money, if you are going to be stubborn and not make plans and not tell anyone what's going on your death or disability may create a huge mess and many hurt feelings. I have seen it dozens of times. In addition to estate planning you need to bring some information together that will make your affairs easier for someone else to handle. You have been doing these things all of your life but if you drop this all on someone else especially an elderly spouse it isn't going to be easy for them. Things you may not have thought about in years will suddenly become important. If you have financial accounts spread out over many banks, brokerage firms and insurance companies you may want to consolidate if you can. It is not unusual for an older person to have accounts or insurance policies that have been sitting for decades in the same place without much attention. In those cases no one will know that you have them. For instance most insurance policies only send out statements once a year. If you die or become disabled and your house gets sold those statements they mailed you go back to the financial institution. This begins the escheatment process where your property will be deemed unclaimed and go to the State. If you have insurance policies or retirement accounts like IRA's you need to look at who the beneficiaries are for those accounts. Your will or trust will not control who inherits these accounts unless you name your estate or trust as the beneficiary which I don't recommend except in special situations. Many times beneficiary designations on accounts have not been updated in years. This is the easiest thing to fix but can be devastating if you have the wrong people named. The more organized you are the easier it will be on you loved ones. Your will, medical information, life, health, burial, long term care policies, pension and social security benefits, financial advisors and accounts, retirement accounts, your bills and vendors, burial plans and any special bequests for your personal property all need to be in a package for your family so they don't have spend weeks or months sifting through your stuff to find it. At any age the end of life can happen suddenly, sometimes disability sneaks up on you and you don't realize it. In either case now is the time to do your end of life planning. Get your affairs in order for your family's sake.